The Minister of Energy and Mineral Development, Eng Irene Muloni, last week explained that the increasing fuel prices in the country are due to the rise in crude oil prices and refinery premium products since the rest of the parameters like taxes, transport and handling costs have been constant. According to Muloni, the hike in prices is a global issue that started last year in August when a barrel was USD 52.02 (About Shs 185,000) and kept on increasing to the current USD 69.45 (about Shs 248,000). This, she explained, was due to the huge storm in the US that shut down many of the production sites and refineries in the US Guld coast. “The oil process continued to increase in November and December 2017 as the Organization of Petroleum Exporting Countries (OPEC) agreed to extend production cuts further in June 2018, showing their willingness to balance supply and demand,” said Muloni in a February 6 statement she presented before Parliament. The minister’s findings were a response to the Kampala Central MP Mohammad Nsereko, who on January 31 demanded to know why the prices of diesel and petrol were increasing in the country. She added that the countries consumption of petroleum products has increased to 7 per cent per annum, with 2.7million litres for each product of petrol and diesel being consumed on a daily basis. Muloni said that of these, 91 per cent is being imported through Mombasa while 9 per cent through Dar es Salaam port. “The strategies to keep the country well supplied, therefore, hinge on the effectiveness of the import routes and the in-country storage facilities. In this case, Mombasa and Dar es Salaam ports together with other terminals in Kenya are all being utilized by Oil Marketing Companies (OMC) to import products into Uganda,” she said. The minister’s statement comes at a time Ugandans across the country are grappling to survive amidst high commodity prices that have been caused by the increase in fuel prices. Earlier this week, drivers of buses that ply the long routes threatened to hike fares if government did not intervene to ensure stable fuel prices. Speaking to journalists, the drivers and operators said they can barely make profits off the routes because the fuel prices have reached unsustainable levels. In Kampala and surrounding areas, the cost of milk increased at the beginning of the week. A litre of milk had shot up from Shs2,800 to Shs4,000. When PML Daily talked to Mr Ronald Asiimwe, a distributor of Jesa Milk in Ntinda, he said there was scarcity of milk on the market and when he inquired, his suppliers told him the cost of transporting the milk was too high. PML Daily did a survey of the increase in fuel prices over the last three weeks and noticed that the prices have continued to steadily go up from Shs3,400 almost one month ago to Shs4,020 at most fuel stations this morning. During the survey, it was also noticed that fuel stations located in different areas priced their fuel differently. For example, Shell Fuel Station in upscale Bugolobi, adjacent to the affluent Village Mall increased the price for a litre of petrol from Shs4,000 on Monday this week to Shs4,020 by Wednesday. 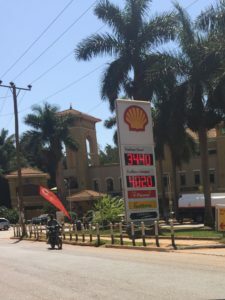 Meanwhile Shell fuel station in Makindye opposite the military barracks had maintained the price of a litre of petrol at 3,900 for the last two weeks, as have most fuel stations located in the areas of Rubaga, Makindye Entebbe Road and Masaka Road. At Total fuel Station in Ntinda, located at the Nitnda-Kiwatule Road junction, a price of a litre of Petrol has been at Shs4,000 for the last two weeks. The increasingly high fuel prices are not just affecting Kampala city dwellers. 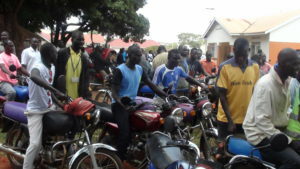 Gerald Arop, a 33-year-old boda boda rider in Gulu town is making less money from his business because of the increase in fuel prices in the country. Arop could not find fuel at Delta fuel station in Gulu service center. He says he used to make more than double profits when he fuels for 8,000/= to offer his boda boda service within the town. Consumers of fuel like Arop say he has no clue what is causing the increase in prices. “It has been difficult to explain to our customers that the fuel price has gone up so charges have changed. Some people just chose to walk. Others feel adding Shs500 or Shs1,000 to their usual transport is too much.” He told PML Daily this week. As he rode off without refilling, a customer who was complaining of boda boda charges decided he would rather walk. Alex Ochola, a resident of Layibi Central Sub-ward in Layibi Division told our reporter that for the past two weeks, he has been paying double for his transport to and from work. “I travelled to Kampala on Sunday and I paid Shs30,000. Now to my home, I pay Shs2,000 Instead of Shs1,000. Sometimes I negotiate and pay Shs1,500 which is too much considering other movements that you have to make within the town during the course of your work.” Ochola explains. Patrick Oloya, who uses diesel every day for his motorcycle says he has limited his movements within town because of the high fuel price. Diesel which is mostly used by heavy duty vehicles working on Gulu and Amuru roads has gone up from about Shs3,600 two weeks ago to Shs3,950 this week at Delta service centre in Gulu. Total service centre sells Diesel at Shs3,980 up from Shs3,940. According to media report last week, Iran’s Oil Minister, Bijan Namdar Zanganeh noted in January this year that oil prices had gone up because of production cuts and increased demand for petroleum products especially in Europe, due to the cold weather. Iran is a key member of the Organisation of Petroleum Exporting Countries, (OPEC). Since last week, fuel prices have not only gone high but oil companies operating service stations in Gulu have had shortages. Delta fuel station in Gulu town has not had fuel for three days. The service centre has a contract with Gulu and Amuru district local governments to supply fuel. This has affected sales at the service centre as prepaid customers cannot get fuel. Victor Omony, the station manager at Delta fuel station, says the station has run out of fuel for a week. This is manifest in the way pump attendants looked idle as they chatted sitting on empty cans telling clients their pump had no fuel. “We have not had fuel for about a week and I can’t tell why. Our major challenge now is with prepaid clients in Amuru and Gulu district local governments because they need fuel for their road works and we can’t say no because they have paid for it already. I tried buying from others to supply them but I stopped because the shortage has gone on for long,.” Omony noted. He added that the company has lost more than Shs20million in revenue within three days of having no fuel completely. “The loss is big. Clients are disappointed and some don’t easily come back. By the end of this week, we are hoping to get some fuel from our depot in Kampala to keep us moving.” He adds. Meanwhile at Total, diesel has run out for two days. The price of a litre of petrol and diesel had risen as of this morning at most fuel stations.